Summary: When a certain someone cannot attend his sister’s wedding due to the scrutiny it will garner on his only sister’s biggest day, Yunho finds some other way to ensure the man understands that no matter what it looks like on the outside, he will always be an important member of the family. AN1: Happy YunJae Day…seriously IDK why I’m hit hard with feels today of all days. This is a oneshot and forgive errors please as I literally wrote this in the last two hours. Also, I noticed my stupid computer is autocorrecting oppa to oppo so if you see “oppo” just ignore the damn things. AN2: Credit goes to Ran who will probably be the sole reason why fandom is slow to react when we do get a REAL SELCA. Ugh...Ran's edits kill me. It's too good and it hurts and the pain is beautiful, I can't explain it. Jaejoong wrings his hands anxiously, the hood of his jacket up over his head, his famous face hidden deep within. He keeps his head bowed, his cap pulled down low, and he takes one last look around before he rings the doorbell. It opens with a hush, and an older woman exclaims. “Aigooo, it’s so warm and you’re dressed like that? Come in, come in, you can leave your jacket in the same place.” She steps forward to squeeze him in a tight hug before stepping back. His eyes grow warm at the woman smiling fondly at him, and he does as he is told, relieved at discarding the jacket. He takes off his cap too, hooking it next to a similar one, smiling at the fact that the original owner of his cap has managed to find a replacement. “Everyone?” Jaejoong hurries to where he has been instructed, curious and perhaps a little anxious. What is going on? “Wh—why is he here?” Jaejoong asks, allowing her to bring her to his beaming parents where he bows in greeting, before hugging his father and kissing his mother on his cheek. He had just spoken them that morning and neither of them had told him about being here. “Oppa insisted, and you know when oppa insists, everyone falls in line,” she grins, sending a look to her father to whom Jaejoong is bowing to next. She tilts her head in a meaningful way and the man lets out a minuscule sigh, before stepping forward to embrace the slightly stunned soldier. Jihye’s broad grin makes her look like her older brother in that moment, and her fiancé smiles at the happiness in her eyes. He has met Jaejoong in passing on a couple of occasions, but the idol had always shied away from being properly introduced. One look at his affianced is enough to banish any feelings of apprehension though. It is very clear she cares about the man. In the blink of an eye, the shy, sheepish, slightly awkward man in fatigues transforms into what can only be described as a protective oppa. The room watches with bemused fascination as Jaejoong wastes no time in warning the poor man what was what. They are not threats he has not heard from Yunho himself, but for Jaejoong to pretty much echo the same sentiments, certain phrases even repeated word for word. His words falter when someone hugs him from behind. Colouring instantly, immediately reverting to the shy soldier who entered the room quietly, he blushes deeply, bowing his head and trying to pull those arms from around his body. “Why not?” He questions, but he drops his arms regardless. “Everything is ready, let’s go,” Yunho’s mother bustles in, smiling at her son linking arms with their guest, before nodding to her daughter and her fiancé. Jihye steals Jaejoong from her brother, cornering him as everyone else walks past them. Changmin brings up the rear, but his progress into the other room is thwarted when Jaejoong grabs his arm. Changmin’s expression turns positively beatific, clasping his hands primly in a choir boy stance, he starts to list all the ways why that is true. The Soulfighters forget where they are for the moment as Jaejoong chases the incorrigible maknae around the room much to Jihye’s consternation. “OK OK ENOUGH STORIES.” Changmin exclaims loudly, waving his hands at his hyung’s only sister. They are interrupted by Jihye’s fiance, set back in no doubt to find out what the hold up is. Jihye turns, hurrying to his side, she whispers something into his ear that makes him smile, and he nods, turning to leave. She then heads back to Jaejoong’s side, taking his hand, looking at him in the eyes. Changmin, knowing what is about to come, starts inching away, though his curiosity drags his feet more than it should. They continue to argue, not answering Jaejoong’s question. Jihye’s patience has run out, and the prim and proper girl everyone thinks she is vanishes for a brief moment as she kicks Changmin hard in the shin. Ignoring the man’s yowl of pain, she turns back to the confused soldier. The guests are all mingling, having known each other for so long, they chat comfortably as they wait for the man who has locked himself up in Jihye’s room. Yunho is nowhere to be found either. “I’m not sure how auspicious this start is,” Jaejoong’s mother declares worriedly, her words waved away by Yunho’s mother. “Yunho wants to do things properly,” Mr Jung responds, albeit a little stiffly. His wife pats his arm, and his stern countenance loosens a little. The four of them decide to change the subject while they wait, though the mothers keep glancing over at the doorway, waiting for one or both of their sons to emerge. The willowy brunette captures her oppa’s hand and links their fingers, gently tilting the older man’s eyes to hers, her heart catching at the tears shining within them, ignoring his expletive. He really is upset only the way he can be. A firm knock sounds on the door. “Don’t open it,” Jaejoong pleads, looking at his soon-to-be sister-in-law. “Jihye, let me in,” Yunho’s voice is firm. Jihye moves to the door, opening it just after a second knock. She is relieved that her brother does not look angry or sad. He just looks serious with a tinge of worry in his eyes. Changmin is hovering behind him with an identical look in his eyes. “There’s no need for that, Changdollie,” Yunho replies quietly. He hugs his sister, and then squeezes past her, shutting the door of her room behind him and locking the door. He turns just as a solid body crashes into his arms, and Yunho stands tall and fast, hugging the sorrowful soldier gently. Yunho uses his thumb to gently turn Jaejoong’s face up to his. Tears cling to long eyelashes, and he kisses each dew drop away, nuzzling against the other’s man’s soft skin. Being a soldier has not detracted from Jaejoong’s good looks, the man a chameleon and a true survivor, able to fit himself to suit any situation. He is a handsome soldier, the handsomest that Yunho has ever seen and it takes his breath away. Jaejoong leans back in the protective circle of his boyfriend’s arms, his guileless doe eyes fixed on serious almond ones. Even without a hint of makeup, he does not realise how truly breathtaking he is and how Yunho sees him. Jaejoong’s hand curls against the warm, thudding, sure beat of Yunho’s heart. He blushes at the words, but he is still concerned. He is always concerned. He listens quietly. He always listens when his leader speaks, and quiet, earnest, heartfelt words of a man who is trying to do right by someone he loves. Trying to do right by him the only way he knows how. To protect him from and banish the insecurities that afflict him every now and again when he worries about being a disappointment. That he should have been a girl. That he should have been prettier and born different. That he should not be himself. And he understands what Yunho is trying to do, and he loves him all the more for it. Siwon frowns at his phone. The solemn ceremony witnessed only by immediate family and himself that had taken place not two days past still fills his thoughts. It was simply, and beautiful, and just perfect for the two men he cares more for than he will ever admit to his dying day. Four simple words live in his heart, and from a time long ago when he used to step back to allow them to sing it to each other, to the day when they exchanged Cartier rings that they will not be able to wear in public for awhile, and yet it is the very essence of the newly married couple, accepted and recognised for who they are by their families. He shakes his head from the haunting words uttered by both of them to each other, when a phone is put under his nose. Changmin takes one look at it and bursts out laughing. AN: Sorry, I’m just being fanciful today. A lot of love in the air online etc and it’s making my heart smile and ache at the same time. It’s bittersweet. Have a lovely day everyone. Oh Nikki...This was beautiful ;; Jaejoong freaking out remind me so much about the fic you wrote about him meeting Yunho's mum and freaking out at 3 am, making poor Junsu do the laundry and Changmin go buy food from goodness knows where. Also Jaejoong becoming all protective bear over Jihye was the cutesr! I can't stop smiling :') Yes Jaejoong, we hear you loud and clear. You are KJung. happy YunJaeDay to you Nikki. it's amazing how you pulled everything together. so sweet. and yea I still cannot get over that signature of his lol. how to have a Jung Yunho in my life please? so considerate and lovely and hopelessly in love with Jaejoong. and Jaejoong's insecurities. awwee. im glad Yunho's there to make him feel better. and MinFood! 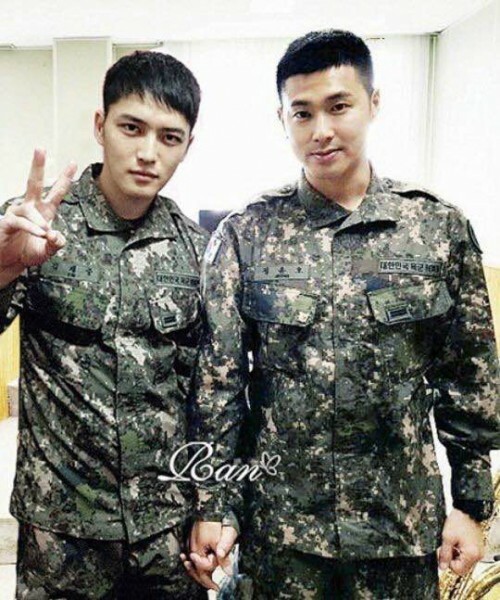 the realest OTP next to yunjae hahahha thank you for sharing this with us, Nikki ;D Happy Yunjae Day! This is truly precious. Jung Yunho will always be Jaejoong's protector bear. Hehehe you make me giggling when Soulfighter appeared. You also make my eyes teary for Jaejoong's insecurity and how Yunho assured him. Thank you for writing this Nikki. OMG! This is so beautiful! Thank you for writing this and Happy Yunjae Day! This is a successful one short. Short but oh so sweet. I was smiling from the first paragraph onwards. You still have the magic touch girl! Simply beautiful and very meaningful. I couldn't help it but had a huge smile while read it, it was really beautiful! I'm crying.. i don't know why, yes this make hearts smile and ache at the same time.. god.. why am i crying this much, i honestly lost and confused, i just saw jae's newest pictures in fb.. and here i don't know what to say.. jae's insecurities.. is somehow real.. and those feelings are truly terrible.. that he shouldn't be himself.. that he being a disappointment.. it's painful..